During my formative years as a horror fan, there was a time when I would sneak down to the family living room, turn on USA's Up All Night and watch some low-rent horror film that managed to get by amateur acting, a copious amount of bloodshed and lovingly-crafted, dripping-with-latex practical FX. More importantly, the director's vision was clearly apparent even if it was limited by its budget, furthermore, it had heart. 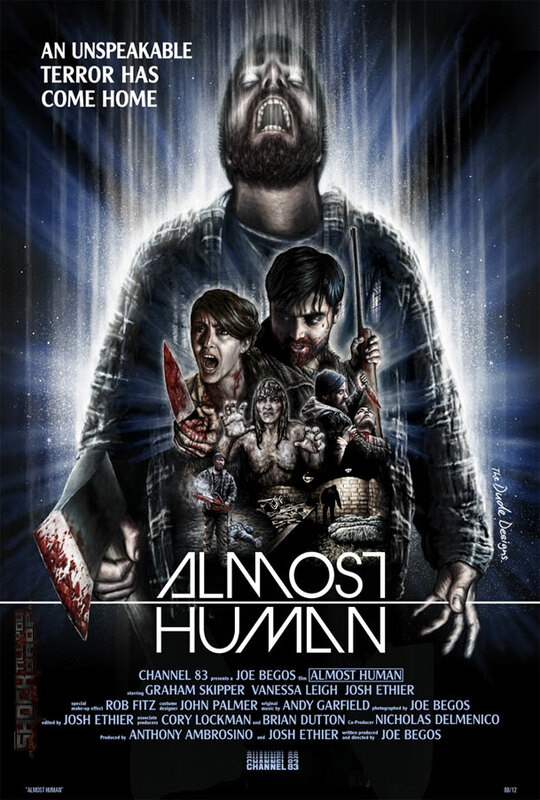 Almost Human is that kind of movie. A down 'n dirty, back-to-the-basics splatter flick that should make any horror fan grin from ear to ear. Written and directed by newcomer Joe Begos, this micro-budget indie effort has a lot of warts, but because it does know what it is and because it does know its limitations and it is told with a lot of love, it's hard to pick on the film's faults. The script is suprisingly simple, rocketing out of the gate with the introduction of Seth (played with wide-eyed, nervous enthusiasm by Graham Skipper) who witnesses his pal Mark (the imposing, cool-as-a-cucumber Josh Ethier) get abducted by – more or less – aliens. Two years later, the disappearance of Mark still resonates with Seth and their mutual friends until, one day, Mark returns. But it's not Mark. Not entirely. There's something very "off" about the dude. And, he's got an agenda and no one is going to get in his way – not even Seth. Almost Human has a nice emotional thread at play that concerns loss and grief. It's minor, but let's be thankful a flick like this even has some emotional beats to hit. When it's not focusing on this angle, the film is full-throttle crazy town with Mark slaughtering those he meets in brutal ways. Blood flows, folks. Oh yes, blood flows. And it's gleefully executed in various practical ways. Also, Mark reveals that he has a few extraterrestrial talents which are a hoot to watch and will make some squirm in their seat. What the film suffers from is some pacing issues, further, the script drowns in exposition. Regardless, this is a movie that lives and breaths "midnight movie." Accept it as one and you're going to have a great time.